Since the time of the ancients, bookbinders have struggled to back books quickly and efficiently. Early on, they avoided it entirely by naturally rounding and backing, later they would locate the nearest large hammer and apply it with great force to the spine of the book. Even though this is great fun, after a while, the hand and arm tire, the mind wanders and bookbinders began to dream of mechanical devices to accomplish this task, which culminated in the electric backing hammer. The origins of this hammer are unknown, and the last known example, thought to be made in the 1960’s, is represented by a single surviving example. I trust that this small contribution to the history of bookbinding will, perhaps, demonstrate the importance of this almost forgotten tool. So, dear reader, let us take a brief tour of the illustrious, noble, and little known history of electric backing hammers. First of all, however, I most humbly and modestly would like to point out that all scholarship concerning the history of the book is a load of crap. Below is a book, printed by moveable type, in my possession, from the year seven. This pushes back the origins of movable type by fourteen centuries. Fig. 1. An example of a book printed in the year 7. The binding has an ms. inscription on the upper board that mysteriously reads, “BOUND for lil’ J. CHRIST”. I would be extremely interested to find J. CHRIST– any information as to his whereabouts is much appreciated. Anyhoo, there are virtually no references to backing, and especially electric backing hammers until the 17th century. 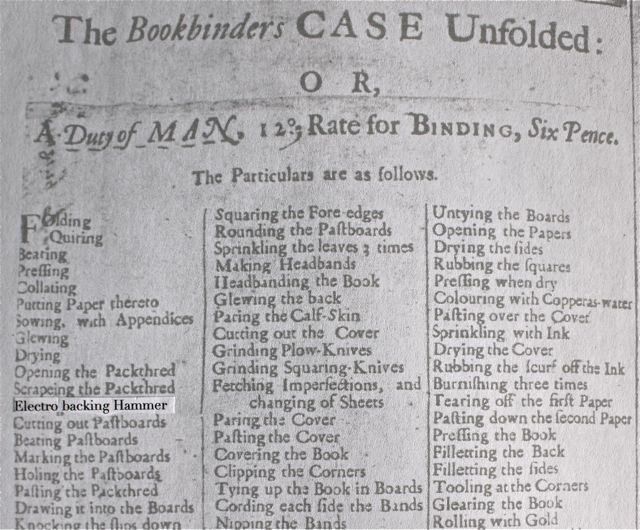 The first reference we have to an “Electro backing Hammer” is found in the c. 1694-5 broadside of a bookbinder’s sequence of operations known as “The Bookbinders Case Unfolded”, which was found bound into Samuel Pepys copy of Moxon’s Mechanick Exercises. Bernard Middleton wrote about this broadside, which is considered the earliest detailed description of English bookbinding, although inexplicably, passed over the reference to electro hammer without comment. There are no known examples of this hammer. Fig. 2. The earliest known reference to an ‘electro backing hammer’, c. 1694-1695. Believe it or not, many so-called ‘authors’ from this time didn’t even know the difference between an “f” and an “s”! Fig. 3. An early ‘magic hammer’. Mirrors hide the source of power for this floating hand ? 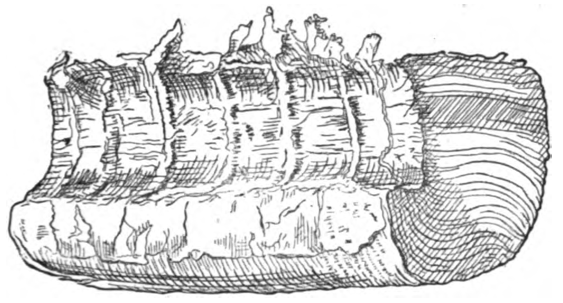 Most illustrations, like Fig. 3, originally from 1467, but redrawn and used numerous times, are at best a bit vague as to the exact mechanism involved. There is a chance that this might be an early mechanco-electric powered hammer. 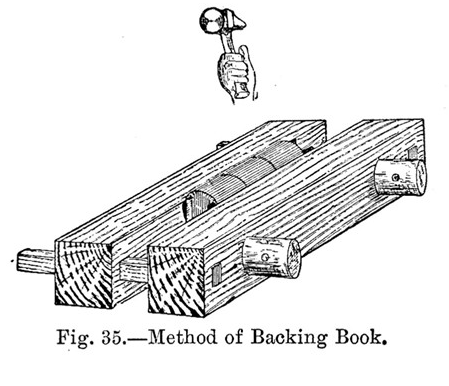 Although the title misleadingly reads, “Method of Backing Book”, the author neglected to include any actual information about this method of backing a book. The reader is left with the impression that a hammer is held over a book then, presto, it is backed, magic. Around the time of the Enlightenment, the first automatic style backing hammer makes its appearence. Fig. 4. Above is a French water powered book backing machine, c. 1767. The first actual record of an automatic book backing hammer, Le Gros Marteau, is pictured in Diderot’s magnificent encyclopedie. The limitless power of a running stream is harnessed to replace the toil and drudgery of the bookbinder. This ponderous mechanism may account for the unusually solid, inflexible spines usually found of French books of this time, and even today in French fine bindings. By the by, in 2007, French fine binders purchased 27% of the world’s sandpaper. This water powered hammer is an ancestor to the electromagnetic hammer of the 1960’s. Notice it is big. Modern style people like small things: cell phones, tic-tacs and the Fiat 500. Modern style people don’t like big things like this machine, but they do like big screen television, but it has to be thin in its thickness. But I digress. And I will digress further. Notice the exceptionally fine decoration depicted on the edge of the book, pictured above. It appears to be some kind of gauffered allegory. The scene depicted is difficult to interpret– perhaps the wolf child is running towards liberty? Why is it’s mouth slightly bleeding? What is the strange symbol on the flag down near the fore-edge? Could this bizarre scene somehow be interpreted as fear or anxiety about the machine replacing human labor? Fig. 5. A happy and contented Roger Pain demonstrates the backing position known in the trade as ‘coat hanger’. 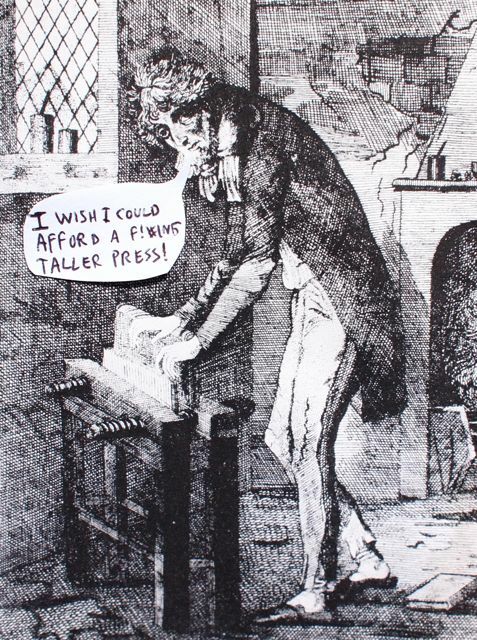 This illustration of Roger Pain makes it clear that these knee high press-tubs were generally used by children and hunchbacks. Why is he wearing his bedroom slippers, and backing an already covered book with his hands? This etching dates from 1700 & something, I got tired counting all the “X”s and “I”s. Why were those people so stupid that they didn’t write real numbers? The French were a bit more advanced in their book backing technologies, and after Le Gros Marteau, they mostly dispensed with hammers altogether, instead using the elegant, fantastically designed, sophisticated, efficient, and vastly superior in all respects tool called le froittoir (ON SALE NOW !). Mechanization in late eighteenth century England was generally avoided in preference to child laborers and hunchbacks. Some of the terminology of olden times is confusing– children were often treated like ‘little adults’, especially when they were married at age eight. But what if they actually were little adults? Maybe smaller adults are fewer vittles? And if children ate fewer vittles, maybe they became smaller adults? The English contributed greatly to the history of book backing by offering young children the opportunity to play alongside adults. By the early nineteenth century, bookbinders backing hammers were marketed specifically for children. They were sized “000” to “4”, with size “000” used 5 year olds, “00” for 6, and so on. Small pieces of rock candy was given as rewards for the children upon meeting production goals and submitting properly formatted quarterly reports. Fig. 6. 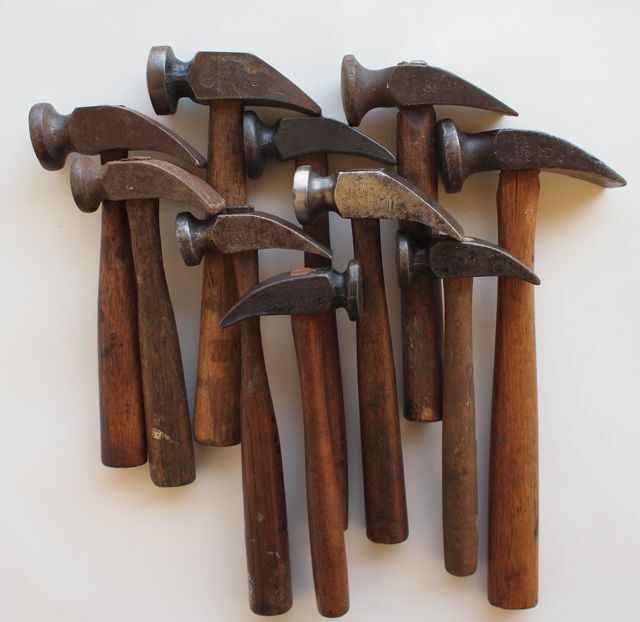 An assortment of 19th century backing hammers. They are all stamped “Made for Children” on the cheek not shown. Notice how dirty they are. Everything, and everybody, was dirty in olden times! Child labor was one of the great delights of the olde days– men and women would often have plenty of spare time to write their names with lots of curlycues. But eventually the teeming masses of children workers could not keep up with the onslaught of books spit from the mouth of the cylinder press. Unbacked books began to pile up in enormous warehouses. Factory owners grew morose and stared out of coal stained windows, eyes focused on the horizon, while their teeth clenched ever tighter around an unlit cigar. Something needed to be done. Fig. 7. Because of the demands of the work, bookbinder food was invented. Snapper soup proved ideal. At first it was thought special diets might help the workers keep pace with production demands. 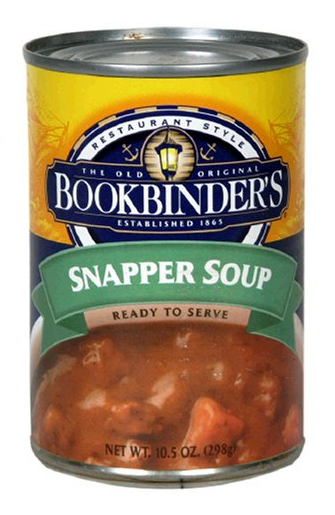 During the last half of the nineteenth century, many different companies produced bookbinder food, and Snapper Soup was very common. The penial gland of the red snapper fish contains a vital fluid which is essential for the productivity of bookbinders. Similarly, most bookbinders today, myself included, need to dine on premium quality sushi at least twice a week. Alas, even this unusual dietary supplement was not enough to help the child laborers keep pace. A more rapid means of production had to be found. The scientists were forced to turn to their last resort: science. The stage was set. The field was ripe for the induction of electromagnetism. Karen Hanmer sent me this bit of personal history, which fills a small gap in this still largely undocumented history. 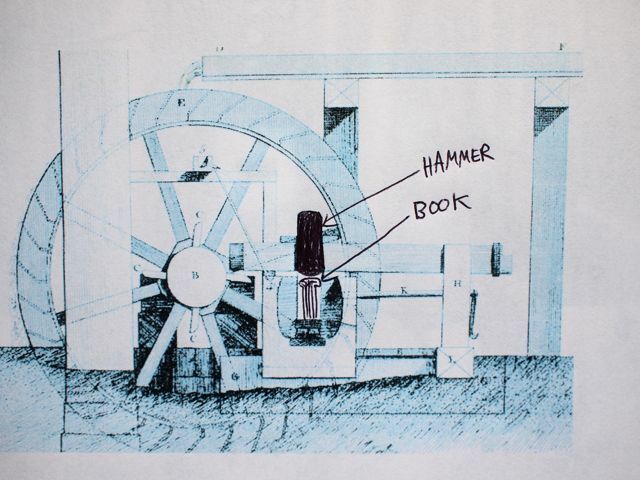 Although we know that Tesla worked for Edison, and Edison essentially cheated him out of a huge bonus for redesigning Edison’s DC motor, when he began, or gave up, on the AC backing hammer is still unknown. Similarly, the next half century is essentially devoid of information related to electric backing hammers. But we do know that the first, commercially viable electric backing hammer began production in 1966, in West Germany, and was marketed and distributed worldwide. Fig. 8. The only extant electric backing hammer, collection of Peter Verheyen. Peter Verheyen, has the only electric backing hammer that this author is aware of. Peter writes, “This backing hammer features electrically activated percussive action on both sides of the head for precise and faster backing for today’s less robust binders.”  Peter is an expert on less than robust bookbinders, and he seems to know a bit about backing as well. I visited Peter, in an attempt to try out this rare bird. The head rotates on an axis to the handle, mimicking the proper hand motion. Since this hammer is the only known example and was basically NIB, and Peter requested I only visually examine it. I had to wait until the he left the room I was not able to plug it in and try it out, so I do not know how rapidly it can jitterbug out of control then make dents on his workbench and I also do not know how easily the face can become chipped when it falls on the floor. W.O. Hickok discontinued the electric backing hammer (their model #WOH13459) at the same time they discontinued regular production of most of their traditional binding equipment (not sure of the actual date). However, as with all of their binding equipment they continued to offer it as a made to order item from the original molds and patterns. I first learned about this from an acquaintance at the old Ruzicka Bindery in North Carolina (since bought out by Etherington Conservation, Inc.). They ordered a gross of polishers (the manual version) but found the barrels were not attached to the shaft at 90 degrees, which of course made them useless. Apparently, without the old master toolmakers around no one really knew what they were and could not properly interpret the drawings. At first they thought it was an “offset” bookbinding hammer, according to the guy at Ruzicka. At any rate, about two years ago I inquired about the electric backing hammer. My original one is still more or less in working order, but it’s pretty banged up (no pun) after a carpenter putting in a new set of steps to my building “borrowed” it. I thought that since the electric hammer was a bit more modern than polishing irons they might still be able to do a passable job on a custom order. After several transfers I eventually talked to a young archival engineer at Hickok who seemed pretty eager to look into it. Long story short, he said he could use the original drawings to do a cordless version (12V, which may explain the lack of umph). As I had just signed a contract for hand binding the print version of Wikipedia (hence the digitally enhanced endpapers) I thought it worth a shot and Hickok offered to defer the development cost if I bought a dozen. Given the scale of the project and the special pricing ($675.00 ea) I though this was worth a go. But the results were as I previously reported. I can send you one to try for yourself if you’d like. Maybe T. Conroy should have one for the Bookbinder’s Museum, if he doesn’t already. Do they have an outdated technology section? Anyway, it was this same archival engineer who told me about the pending IEEE 802.11q standard. After I sent him my review of the cordless model (which really ticked off Hickok–no more free development) he said he was interested in going for low frequency wireless electric. He thinks it will change the world–wireless electric, not the backing hammer. I don’t hold out much hope for either, especially for those of us this far off the grid. But I’ve been wrong before. Although electric backing hammers are practically extinct, there are hundreds of thousands, if not millions of book spines that at least to this conservators eye, look to have been electrically backed. The rapid blows create an almost pointillist scene on the spines, quite distinctive, sometimes quite pretty, and one time eerily reminiscent of Seurat’s Sunday Afternoon on the Island of La Grand Jatte. In fact, there often is no shoulder, just a depraved, gaping concavity in the center of the spine. An unbelievable number of books that have suffered this total spinal obliteration, as illustrated below. I presume that many conservators have seen examples of similarly depressing vandalism. Books that have been electromagnetically backed range from disastrous to preposterous to maliforous. 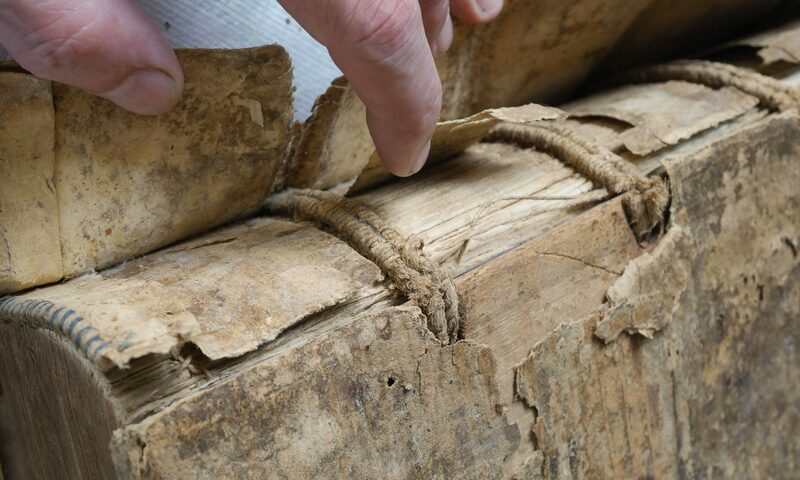 They are distressing to encounter, yet it is important to understand and analyze how the tools and techniques of earlier bookbinders could have caused such damage. A book conservator’s job would be much easier if bookbinders would have left the books alone and satisfied their craft urges by gluing little old things into a printer’s type drawer and hanging it on the wall. Like many aspects of bookbinding history, the books themselves form the primary evidence of their making. 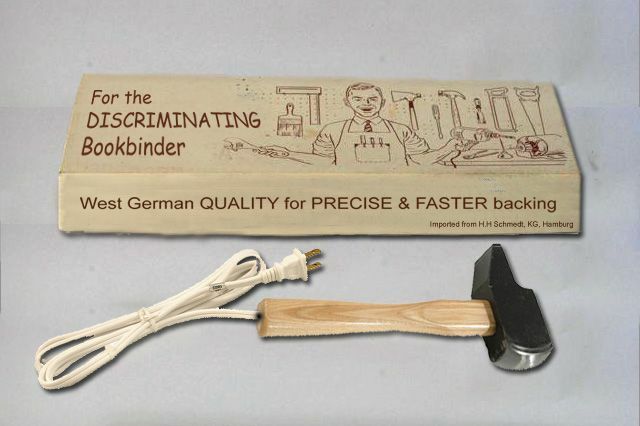 The saga of the electromagnetic backing hammer is yet another chapter in the long, largely unwritten history of bookbinding, and bookbinding tools. 3. This is a excerpt from a traditional German bookbinders song from 1842, (p 70). The song recounts many of the operations of binding. 4. Karen Hanmer, email message to author, 25 March 2011. 5. Comparato, Frank. Books For The Millions. Harrisburg, Pennsylvania: Stackpole, 1971, p. 109. 6. Tom Conroy, email message to author, 24 March 2011. 7. “I recently tried out the cordless model but found the battery life far too short when I’m doing edition work. Keeping a second battery in the charger helps, but the replacement is usually discharged well before the recharge is complete, so I still come up short. As the day goes on there is less and less time between swapping out the batteries until I’m forced to switch back to the manual hammer to finish backing a large book. Unless fully charged, I find the cordless hammer also lacks the “umph” to deal with big folio volumes, especially those with digitally reinforced endpapers. The corded version doesn’t have these same problems, of course, but the cord is always in the way, especially for a left-handed binder. I hear there is talk of a low-frequency wireless electric hammer in the works–no cord, no battery–but wireless electric service isn’t available in this part of upstate yet, and may be a long time coming. Perhaps by the time it gets here the new IEEE 802.11q standard for low frequency wireless electric devices will have been approved, which should be a big improvement. Until then, it looks like we are stuck with unwieldy cords, short-life batteries or even manual backing hammers.” Anonymous Bookbinder, email message to author, 26 March 2011. 8. Anonymous Bookbinder, email message to author, 26 March 2011. It is always prudent to be extra cautious as to the veracity, or lack thereof, of Anonymous sources. Thank you so much for sharing this interesting history. I had no idea there were even such things as an electric backing hammer. I will try to find one, since I rebind a lot of old manuscripts and the vellum is very hard to pound. But you are wrong about the history of books, I have a French book similar to yours, that is from the year two- a full five years earlier than yours. High five! I’m a rock star! Thank you Jeff for this very thoughtful post. It definitely helped me understand more about the tools used for the task. I will continue my research into the whys of “rounding” (That is the correct term, no). In the one bookmaking class I took my results looked very much like your last image and the instructor was very pleased with the shape I achieved. Not so much with the way I damaged the paper though… So much to learn. Thanks again for all this. This kind of accurate and well-researched information is exactly what I need more of. Jeff, it is these very explorations of the untravelled roads of our venerable bookbinding culture that will ensure your name is written in electric lights in that great bindery in the sky. I will certainly keep my eyes open for the clever electrified manifestations of our tools kept at hand. But… Am I missing something? Doesn’t everyone back round and back in their bed slippers????????? the posts are too brief for newbie’s. May just you please lengthen them a bit from next time? The book length long treatise is forthcoming in Hardcover. Great Tool Information and for the most part very accurate (more so than I am used to in blogs I must add), But I am confused about the mention of the Book from the year VII? No one has pointed out that the Book I am an avid book collector and actually enjoy trying to read my books when I can find the time. That being said I am not aware of books from the first century or the first millennium AD for that matter. Your reference to Don Quixote by Miguel de Cervantes your yours which is the French translation was published in 1605 & the second book in 1615. Movable type was brought to Europe by Johannes Gutenberg in 1439. This was 166 years earlier than the Spanish book was published. 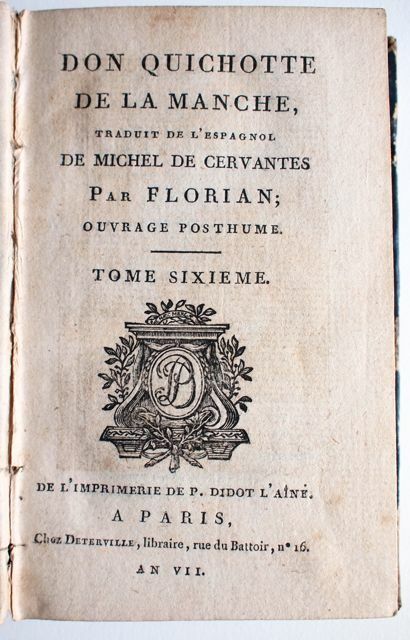 The French Translation was not until after 1700. I am a bit clueless here but it is a little wrong to lead the uneducated to believe that that is a book for the year 7. Great! You have a real collectors item!